The window screen is engineered to do more than block out mosquitoes, spiders and pesky flies. It’s a critical part of the ventilation system of a house, particularly in the summer. And when a house – and its windows – are constructed well, those open, protected apertures can often reduce the dependency on high-emissions, expensive air conditioning systems. We all know that heat rises. But what is often overlooked is that heat doesn’t just rise to the top of a room or a space, it can move all around. This is because warm air has a higher density than cooler air, so it tends to “stack” and fill spaces more efficiently than cool air. That’s why it’s often hard to cool down a hot room with one large screened window. For the cooler air to enter and the hot air to leave, there must be an exit area that can help displace the hot air. Windows that are designed with two openings, for example, a pull down window at the top and a frame that raises from the bottom are often the most successful means for ventilating a room. These double-hung windows allow the air to circulate and “push” the hot air out, thus making room for a cooler, less dense breeze to enter. And a home occupant’s own sophisticated cooling system helps. When we sweat, our skin is cooled by that light breeze we feel from a well-ventilated room and the passage of warm air rushing to an open, alternative opening. That is why screens that are made with efficient, light materials that are the least obstructive to air flow are also an essential part of a house’s ventilation system. Solar screening can block out as much as 90 percent of sunlight and may be ideal for rooms that face hot sunlight in the afternoon. Doing so can keep the room cooler. Today’s ergonomic home relies on lighter and more efficient materials. Finding the right combination of windows and window screens for a house is essential not only to appearance and beauty but to that very purpose that screens fulfill: a comfortably ventilated, easy to operate home that reduces dependency on carbon-emitting technologies. The finer mesh that is used in many screening products these days offers more light and airflow. At the same time that efficiency helps to keep out tiny bugs that could slip through larger apertures. Removable screens build on the conventional concept of an insect screen: a barrier that can be removed, cleaned and reinserted with minimal work, but keeps a room ventilated and bug-free. Tightly woven mesh that is adapted to meet the lighting demands of the room work best with this kind of screen. And, as explained above, openings work best in pairs, so fitting a room with more than one window that can let the room ventilate is ideal with these kinds of screens. Larger screen doors that allow for passage in and out of a room (such as a dining room or an atrium) keep bugs out but without impeding air flow. Newer models are made with the convenient feature of a self-closing track to ensure the screen isn’t accidentally left open. Retractable screens that work in synchrony with the window and allow for free-flowing air when the window is open and disappears from sight when it’s closed are great for are great for homeowners seeking easy-to-use solutions. Requiring no storage, little cleaning, they are often the most efficient when it comes to cooling down a room quickly and economically by allowing cooler air to enter and warmer air at the top of the room exit. Efficient window screening that increases light in the room, is made from finer mesh, and is more durable works in tandem with well-built, leak-free windows. 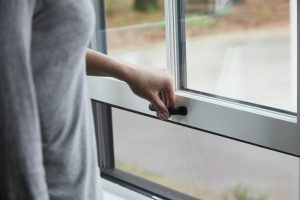 Picking the right window design and set-up for your home that allows for proper air flow is an essential part of reducing cost and increasing your home’s energy efficiency. This article series is sponsored by Pella Windows and Doors and went through our normal editorial review process.